All the Mommy’s with their babies…minus Mr. Nishad. Such cuties! Life doesn’t get any cuter than this! This past weekend we painted the town red. We booked a room at the Hyatt in Minneapolis for some “downtown” fun! our room was on the 6th floor so we had a sliding door/private patio that led directly to the pool- very cool! We started off eating lunch at the most fantastic Thai place; Swatdee. Tiger has a new favorite cuisine. He couldn’t get enough of the Thai food. Ashish is super excited as they offer cooking classes! He took a few different ones in the past offered through Byerly’s, but this sounds right up his alley! We then headed over to the Mill City Museum where we learned how to feel like a proud Minnesotan, rich in history. The name Minnesota actually came from the Native American word Minnehaha. 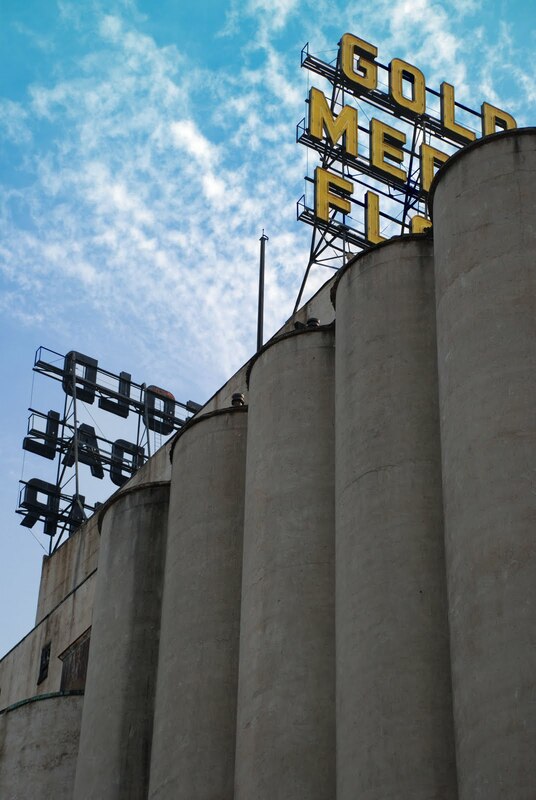 The Mill City Museum is on a great location, however, I don’t recommend the “Flour Tour” for younger toddlers. Tiger was quite scared on the freight elevator and it was rather loud. After we went back to the hotel and relaxed a bit before heading out to dinner at Salsa a la Salsa. This by far is the best Mexican food I have tasted since Chicago. As a matter of fact, this is the second time this month that I ate here. Shhhh! ha,ha. J took me here for my birthday- so I have her to blame! She shared with me that the chef actually cooked for Julia Roberts. At 6PM, we made it to the corner of Nicollet Mall and 12th St, where we “saved” a spot for the D’s and H’s to meet up with us for Hollidazzle! It was a packed parade route, but luck was on our side. We were right at the start of the parade. The weather was perfect and the company- FANTASTIC! After the parade we summed up the night with hot-chocolate and a stroll down the street to take in all the lights. We are so glad the D’s and the H’s met up with us. The following day, Tiger and I started off our day with breakfast at “The New’s Room” while Ashish and Nishad took a swim. Tiger had the “flip Jack’s” while I enjoyed the cranberry-pecan French toast. Hey, “EAT ALL ABOUT IT!” ha. There are tons of flat screens and the walls are covered with “newspaper” wallpaper and between the glass inside the tables you can read antique newspapers. Very neat. I also enjoyed all the Chicago Bear’s fans that were downtown for the game. We all met up and went to Macy’s “In the Life of an Elf” and even picked out our annual “special” ornaments there. This year Nishad picked a baby kitten and Tiger picked up a zebra. Of course, in accordance to my tree, I found two little Irish dancers that will do a merry jig on my tree this year. It wasn’t long before it was time to head over to Minnesota Orchestra Hall’s production of “Hansel and Gretel.” It started at 2PM and was 2 hours long. This was Tiger’s first orchestra performance~ Nishad has become an old pro and just loves attending performances. As a matter of fact, he didn’t want to leave. The puppets that were in the show were so beautiful- so visually inspiring! By the time we made it home, it was around 5PM and all of us were pooped! However, this was an excellent way to kick off the season. And, what’s better than to be blessed enough to have some excellent friends to do it with! Busy, doesn’t fully describe the Kumar Household! With the boys in school, Ashish taking on a new role at UHG and my photography business we’ve been on quite a ride lately! All positive things…but not much “down time.” It doesn’t look as though we will have any down time soon either with the holidays approaching…and my entry back in school for communications this January (I have assignments due prior to my first day of class.) Though it was a hard decision, I’m really embracing my decision to resign as the Chair of the Otsego Park and Recreation Commission now…there is only so many hours in a day. Let me say that my birthday was amazing this year as I was able to celebrate throughout the month. My friend J took me “downtown” to a Mexican place. YUM. My friend S took me to French Meadows. YUM. My friend A got sick, so we will have to re-schedule our time together. The cards and birthday wishes were exceptionally sweet this year. It’s also SO NICE to be surrounded with real, intelligent, fun and caring friends. After living here for almost 5 years, God as helped me sort out the weeds from the flowers in the garden. Thank You for blessing my garden with colors of joy, hope and such beautiful “local” friendships. I have become so found of MB, JH, LC, JG and SK…right in my own backyard. How lucky am I?! VERY. Today Nishad was invited to a Princess Birthday Party complete with it’s own castle and “ball.” It was cute to see all the kids from his class playing and celebrating his friend’s milestone. On Monday I’m having breakfast with MB at the Original Pancake House- love their crepes (they have a location in Oak Park…so it reminds me of Chicagoland). We’re excited to hang out Tuesday after school with SK and her son at Border’s for a little picnic style lunch and books. That night I’m attending a parent night at school. Friday of the same week, I’m serving up a Thanksgiving feast with my Minnesota bestie JH at Nishad’s school. So excited! Round and Round and to Minnesota Orchestra Hall!